It's time again for Secret Recipe Club reveal! My secret blog assignment this month was Dancing Veggies, a blog with a focus on healthy, simple, and quick vegetarian dishes on a budget. Amanda started cooking in high school when her mother declined to fix special meals for her. If she wanted to eat differently from the rest of the family, Amanda would need to cook her own food. Smart mom! While we don't eat a vegetarian diet - my husband would complain loudly if he didn't get his meat! - I think adding more veggies to our diet will always be a good thing. Amanda's blog is a wonderful resource full of interesting and tasty vegetarian recipes I will definitely be trying out in the future. A couple that caught my eye were the Avocado Tomato Grilled Cheese and these Twice Baked Potatoes – Samosa Style. We did make a version of the grilled cheese, which was super yummy, but when my son mentioned that he'd been wanting to try a cauliflower pizza crust, I decided to check to see if Amanda had one on her blog. 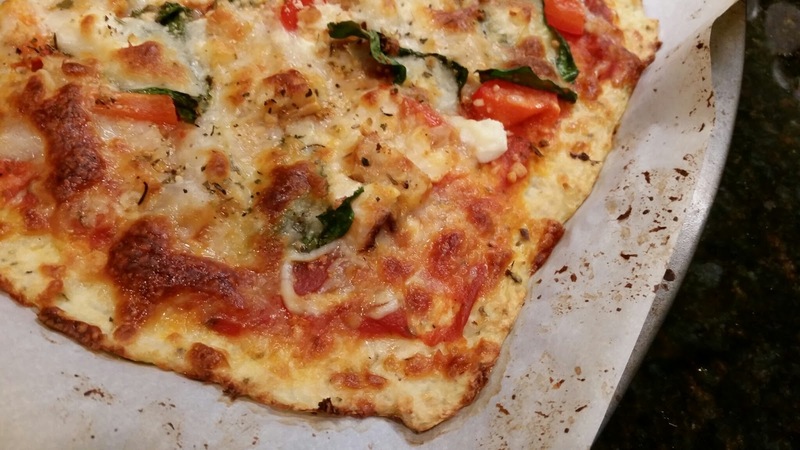 Yes, she did, so we worked together and made an amazing pizza with a cauliflower crust. We did add chicken to our pizza, so it wasn't vegetarian, but I think it would have been just as good without it. In a medium bowl, mix the mashed cauliflower, egg, and cheeses. Add the garlic and oregano and stir well. 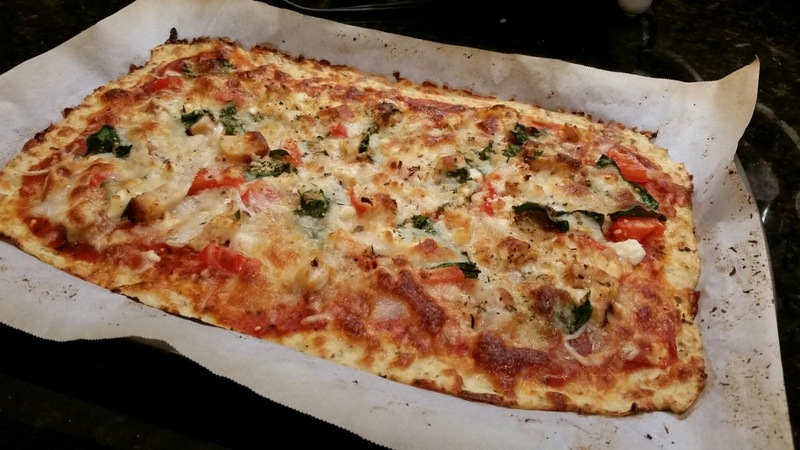 Pat into the bottom of a pizza pan or cookie sheet; bake for 10-15 minutes. Brush the edges of the crust with olive oil and then bake for an additional 15 minutes (or longer), until the cheese and crust are nicely browned. The flavor of this crust is absolutely amazing! All that garlic! Great call, Amanda. It's so good my son said he was going to marry this pizza. We are already thinking of ways to improve it, though. We were in a hurry, so we didn't remove enough of the moisture from the cauliflower after steaming it. Some recipes mention squeezing it out in a dish towel. I don't know that we'll go to that extreme, but the crust did have a little more moisture than we liked, so we'll take that extra step of draining it thoroughly, at least, next time. Also, we cooked it on a cookie sheet with parchment paper - instead of on the pizza stone that I have right there in my oven. So, I will be using the pizza stone next time, and maybe cooking the crust a bit longer before adding the toppings. We're hoping those little tweaks will get the crust just a bit crisper on the bottom. This is definitely a recipe I will be using again. I'm so glad my son was wanting to try it and willing to help me. 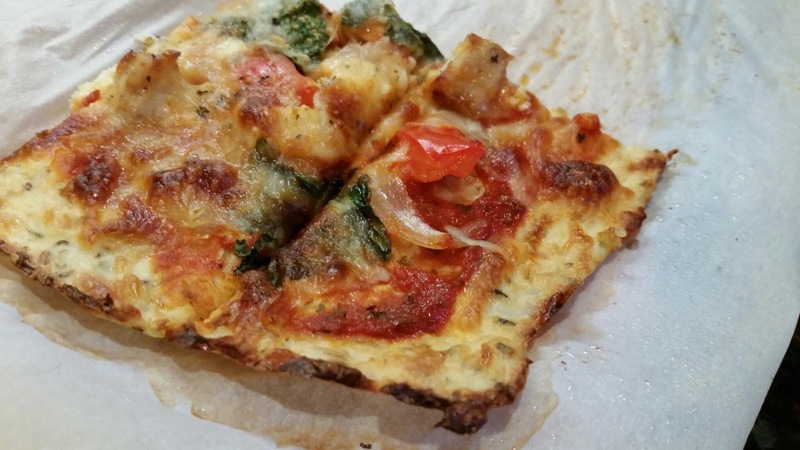 Update: I tweaked it a bit and we had cauliflower crust pizza you can pick up and eat!